To date, no one has assembled a comprehensive compendium of the aggressive censorship strategies and mechanisms now being deployed against users being targeted by the tech giants. 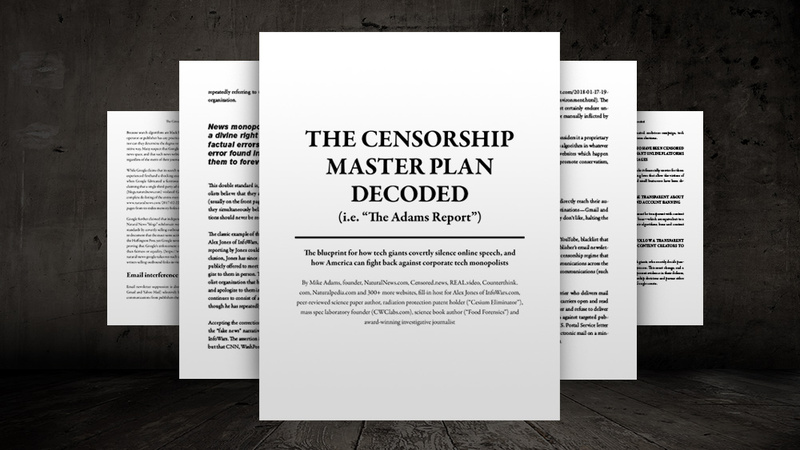 This document aims to serve as a primer “blueprint” to explain both the motivations behind the extreme censorship as well as the technical / mechanical means through which such censorship is carried out. This document should be required reading for any lawmaker, regulator or judicial decision maker interested in protecting the freedom of speech that has served as a critical pillar in our society for over two centuries. #1) Tech giants – Their role is to carry out the mechanics of censorship, shadow banning, “doubt interruptions” and other techniques described in this report. #2) Establishment media – Tasked with promoting the lynch mob mentality of hysteria and hatred which is translated into widespread calls for silencing whatever voices they don’t like: CNN’s insistent demand for InfoWars to be deplatformed from Facebook, for example. #3) Third party fact-checkers and moderators – These groups, such as the SPLC, Politifact, etc., are given the task of flagging all undesirable political speech (or even speech about natural health, as you’ll see below) as “hate speech,” creating the justification for tech giants to ban or deplatform such accounts without having to accept internal organizational responsibility for discriminating against selected targeted. These three “fronts” conspire to attack, defame and deplatform originators of certain types of speech (such as conservative speech, pro-Trump speech, natural health speech, pro-cannabis legalization speech, etc.). Traditionally, watchdogs such as the ACLU would strongly speak out against such egregious violations of civil liberties, yet the ACLU, being strongly affiliated with the politics of the Left, has consciously stood by and watched this “free speech massacre” take place, saying nothing in dissent. Thus, we are now faced with a kind of perfect storm in America — a “free speech apocalypse” — where all the institutions that once called for protections of the freedom of expression are now actively conspiring to exterminate it. This coordinated attack on free speech is now taking place in plain view. The agenda is not hidden, nor is it even debatable that this is taking place. The goal is the complete abolition of all speech that left-leaning tech giants wish to eliminate, and these efforts have been deliberately accelerated as the 2018 mid-term elections approach, carrying out what can only be called an extreme example of election interference and a plot to defraud the United States of America by silencing the voices of those who embody conservative philosophies. Google, Facebook, YouTube, CNN and even the ACLU are all conspiring to defraud the United States of America by silencing conservative voices, en masse, in the run up to a critical election that may decide the fate of our nation. The United States Congress must act. New laws must be passed and enforced that invoke the authority of the federal government to prevent dominant online platforms from engaging in the many forms of overt and covert censorship described herein. To write effective laws that protect free speech, lawmakers must understand the technical mechanics of how censorship is accomplished. That’s the point of this document: To describe the mechanics of censorship as well as presenting thoughtful intellectual arguments that oppose the consolidation of “speech authority” in the hands of power-hungry tech giants, many of which are owned and run by individuals whose own politics reflect deeply-ingrained hatred toward America’s founding principles. Read this document in full. Forward it to your representatives in Washington D.C. Urge lawmakers and our President to act on this now, or we will lose not just our freedom to speak, but our right to meaningfully participate in the dominant public space platforms through which social and professional interactions now take place. The author of this report, Mike Adams, is available to brief members of Congress or Trump administration staff members with further details and analysis. Adams is located near Austin, Texas. See further bio details at the end of this report.